Buffalo wings, blue cheese, and celery. Very traditional and very good and usually, each component is served separately. But why not cut to the chase and combine all of those great flavors into one bite? Buffalo supreme wings do exactly that. Yeah, they’re messy to eat, but that’s part of the fun. I really enjoyed chowing down on Buffalo supreme wings. They didn’t last long at all, that’s for sure. It was bordering on embarrassing, but I couldn’t help myself. That happens with me and wings a lot. Also try my creamy Buffalo wings. They’re mighty good too! For crazy hot wings, try my Five-Alarm Buffalo wings. Note: I like my Buffalo wings saucy, you might end up with leftover sauce. That's not a bad thing. Combine all ingredients in a medium saucepan over low heat. Keep warm until ready to use. 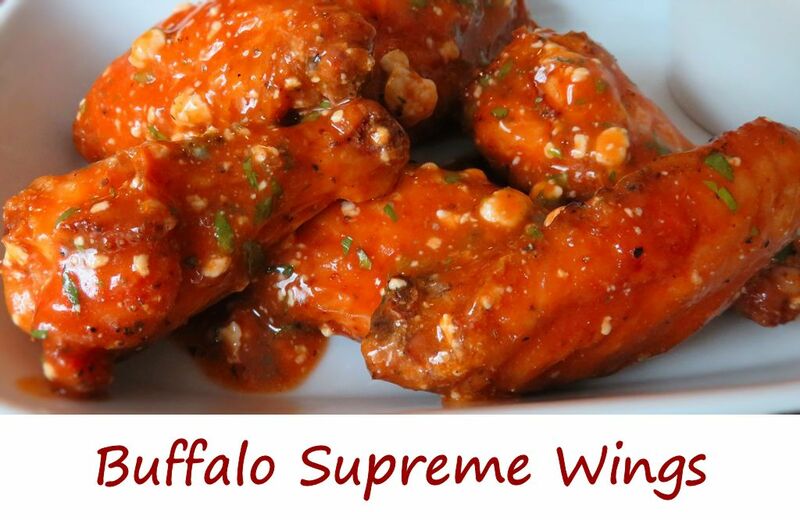 This entry was posted in Chicken Wings and tagged Buffalo Supreme Wings, recipe by Mike. Bookmark the permalink.